Henry Marvell Carr was a landscape, figure and portrait painter born in Leeds in 1894. After Leeds Modern School he trained at Leeds College of Art and then under William Rothenstein at the Royal College of Art (RCA). During 1914-1918, he served with the Royal Field Artillery in France. In 1920, he married Olive Rumble and they subsequently had three children. His career included exhibitions at the Royal Academy from 1921 to 1970, at the Paris Salon and in several regional British galleries. During the 1920s, he completed portraits of the writers Aldous Huxley and Olivia Davis (Carr’s daughter) and landscapes including Dover (1923), Eastbourne (1923) and Near Gravesend, Kent (1923). With the outbreak of war in 1939, Carr was appointed an official war artist by the War Artists' Advisory Committee (WAAC). 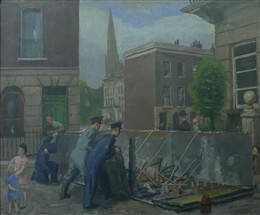 His first exhibition of military paintings was held at the National Gallery in London in July 1940, including the bomb damage scene Dismantling Emergency Water Tank (1940). He went on paint Incendiaries in a Suburb (1941), together with wartime views of London's gothic St Pancras Station and St Clement Danes Church on the Strand. After experiencing a British merchant navy vessel voyage, Carr painted The Merchant Navy: The Chain Locker and Merchant Seaman Fireman (1942). Other portfolio pieces included Ten Minutes Break in the Snow (1942) and Soldier Cleaning His Rifle. Carr was subsequently attached to the British 1st Army in North Africa and Italy (1942-1945) depicting the battles, participants and casualties of both these campaigns. His portraits ranged from US Army General Dwight D. Eisenhower to naval telegraphist Maurice Easton, the latter painted in heroic attitude in An Ordinary Telegraphist, Maurice Alan Easton (1944). Whilst in North Africa, he also painted A Bofors Gun, Algiers (1943). Carr was elected a Fellow of the Royal Society of Portrait Painters in 1948 and awarded a Gold Medal by the Paris Salon in 1956. In 1966 he was elected RA at the Royal Academy. His publications included: Portrait Painting (1952) and Portrait Drawing (1961). He was also a Member of the Royal Society of British Artists, Associate of the Royal College of Art and Member of the Athenaeum and Chelsea Arts Clubs. Henry Marvell Carr died in 1970. This page was added by Ronan Thomas on 03/11/2010. Carr's 'Soldier Cleaning His Rifle' may be found in the collection of Wolverhampton Art Gallery, you can call them on 01902 552055 or visit their website www.wolverhamptonart.org.uk. The 'Dismanting Water Tank' can be seen at Westminster Archives Centre, 10 St Ann's Street, London SW1P 2DE. For more information and opening hours call 020 7641 5180.